Some of the most important health benefits of beech include its ability to stimulate hair growth, protect the immune system, improve the health of the skin, boost newborn health, reduce respiratory distress, prevent infections, relieve pain, detoxify the kidneys, and protect against chronic diseases. Beech trees are extremely common throughout Europe, Asia, and North America and the name “beech” is actually describing the genus Fagus, which comprises more than a dozen different species. Beech trees, despite being common, have been and continue to be very important for a wide variety of reasons. They work as excellent firewood, to smoke various foods and alcohols, and as a construction material for everything from tables to cabins. However, beech trees also deliver in terms of medicinal or health benefits. Their bark, leaves, nuts, branches, and flowers can all be used for various applications and ailments when prepared properly. Most beech varieties are specific to one geographic region or continent (North America only has one species, Fagus grandifolia), so depending on your location, beech trees and beech nuts may have slightly different qualities. However, the genus is quite similar and the medicinal benefits should largely be the same. Let’s take a closer look at some of those impressively diverse health benefits of beech. The unique chemical composition of beechnuts has been said to be stimulating for hair growth and strengthening of the hair follicle beds. If you suffer from hair loss or brittle hair, the oil extracted from these nuts can be added to a carrier oil and used on the hair to boost its appearance and strength. The significant levels of vitamin B6 found in beechnuts make it a wonderful addition for pregnant mothers who want to ensure the health of their baby. Vitamin B6, also known as folate or folic acid, is an essential vitamin to prevent neural tube defects in infants, so adding some beechnuts to your diet is never a bad idea. However, only in moderation, as beechnuts do have certain toxins that should not be consumed in large quantities. Although eating the leaves off of trees is not a particularly common practice, beech tree leaves and shoots have been eaten for hundreds (if not thousands) of years, particularly in times of famine. The high cellulose and fiber content is good for regulating digestion and offers a viable “foraging food” if that becomes necessary on hikes, camping trips, etc. The leaves can also be boiled down to create a poultice or a salve with proven analgesic properties. In traditional medicine, beech tree poultices were relied on to reduce headaches and other mild pain-related issues and are still included in certain herbal analgesics on the market today. This works for both topical application and oral consumption. The idea of eating tree bark might not strike many of you as an attractive prospect, but the bark of beech trees are rich in lignans and other antioxidant substances that can be a major boost to your immune system. Antioxidants can neutralize free radicals that cause chronic disease and cell mutation, including cancer. By drying the bark and treating it properly, it becomes a viable source of hugely beneficial antioxidant compounds! Although the seeds themselves are considered toxic in large quantities, a decoction can be made that is shown to significantly boost kidney function and stimulate urination. 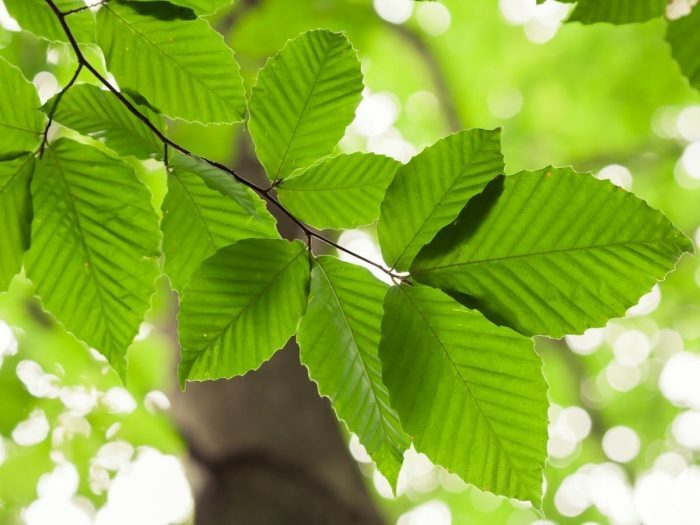 As a diuretic, beech is able to help clear out the toxins from the body, including excess fats, salt, waste, and water, improving the overall efficiency of your metabolism. The branches can be distilled down (dry distillation) to produce a type of tar or creosote, which can be topically applied to wounds in order to protect them from infections and microbes. This sticky substance can also be applied to the skin to improve its appearance, reduce the signs of scarring and aging, and soothe inflammation. Furthermore, research suggests that it has the potential to aid in providing relief from eczema, psoriasis, boils, frostbite, and burns. A Final Word of Warning: As mentioned, there are certain parts of the beech tree which are toxic, so if you aren’t trained to know what type of tree and what part of the tree is used in what capacity, don’t attempt to “forage” alone. Speak to a professional botanist, herbalist, or medical professional before adding any major beech treatments to your regimen.